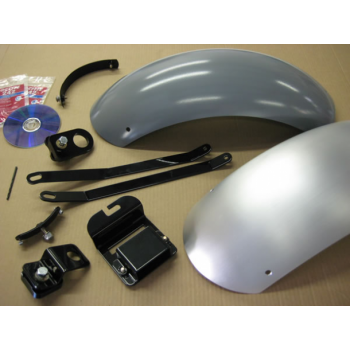 We ship the bare fender with a light-grained surface using a 3M pad, rubbing lengthwise, using warm soapy water. To make the finish look the best on your bare fender, use a 3M pad or scrubbing sponge (these can be purchased at any grocery store - it's the yellow sponge with a green 3M pad on one side). You can refinish your bare fender at anytime using this process if your fender gets small scratches. All the mounting brackets and struts are gloss black powder coated to match your frame. All hardware is included and the DVD shows easy installation. Everything bolts into place with no cutting or welding required. Sorry but our fender struts will not support a passenger.